To enter the contest, photographers must agree to the Rules. The contest is open to photographers who can confirm that they have regularly published pictures in 2018, and been paid for their work. Photographs may be submitted by photographers from any country in the world. Photographers can submit only one photograph. The photos submitted must have been taken between October 13, 2017, and September 12, 2018. The photos must be submitted before September 12, 2018 at 23:59 PM. The photographs must not be embedded. The photographer’s names, websites etc… must not appear on the photo. We recommend that they be included in the photograph’s iptc. The subject of the photograph must be «Yacht, multihull, dinghy, windsurf or kiteboard racing». It includes pictures taken during training, before and after regattas. Photos that do not relate with racing will not be accepted. The photographs must be submitted in high resolution, jpg format. Photos may be stacked, digitally or otherwise enhanced but it is forbidden to add / remove elements from the photographs. Photos taken from a helicopter, a drone or selfie stick are accepted. Pictures extracted from a video are not accepted. If doubts occur regarding the authenticity of the image, the original RAW file can be requested for analysis. The final choice is at the sole discretion of the jury. If the subject of a photograph is a minor (under the age of 18), the photographer can be asked to provide a written release from the parent or legal guardian of the minor. The photographers must own all rights on their photograph to enter the contest, or have the authorization from the rights holder to do so. MaxComm and the event’s partners have the right to use the photographs submitted for internal communication as well as in social and print media in the context of the contest’s promotion. The photographers accept that their photographs could be used in a book / printed document published by MaxComm or its partners in connection with the contest. The name of the photographers and copyright will always be associated to their photographs. In case of publication in a media, the publishers will always be asked to associate the name of the contest and the name of the photographer to his (her) picture. The photographs can be published copyright free by media reporting about the results of the contest in a size not exceeding 12×18 cm. Any media willing to use the photographs in a larger resolution will be asked to make specific arrangement with the photographers. The photographs can be exhibited by the events partners as well as organisations selected or accepted by MaxComm. 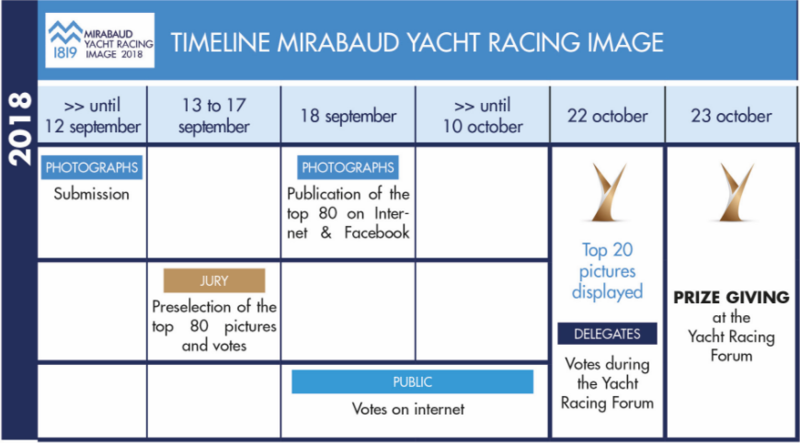 Publication of the pictures competing for the Mirabaud Yacht Racing Image award in media other than the official event website and social networks, for example by media or the event partners, will only be allowed after the publication of the results. A preselection of the best 80 photographs will be made by a panel of three international yacht racing photographers or picture editors between September 13 – 17, 2018. The photographers involved in the preselection are not allowed to participate in the contest. Only the top 80 photographs preselected by the panel of international yacht racing photographers will be published on the event’s website, on September 18, 2018. One main prize will be awarded: The Mirabaud Yacht Racing Image Award. The Mirabaud Yacht Racing Image winner will be selected by the independent panel of experts (see below: Jury) out of the 80 pictures pre-selected by the panel of international yacht racing photographers & picture editors. The top 20 pictures chosen by the international Jury will be announced on Internet and on the social networks on October 1, 2018, then printed and displayed at the Yacht Racing Forum. A special YRF delegates award will be organized during the Yacht Racing Forum, between the top 20 pictures pre-selected by the Jury, allowing the participants of the YRF to vote in order to select the winner of the «YRF Award». The Public Award helps promote the contest through the social networks but doesn’t rate as high as the main award. The selection will be based on the public votes on Internet between September 18, 2018 and October 10, 2018 at midday (CET). The photographers have the right to and they are encouraged to promote their pictures through the social networks as this is considered as a global promotion for the contest and all the participants. An international and independent Jury comprising five to seven members will be named before the opening of the votes. The jury will comprise at least three professional photographers or picture editors, who will also be in charge of the preselection (Top 80). Vote for all the pictures out of the 80 photographs pre-selected by the panel of international yacht racing photographers. This vote will take place between September 13-17, 2018. The overall winner will be selected by the jury amongst the top three during a meeting or conference call, between September 18-20, 2018. This conference call will take place in the consultative presence of a representative from the organiser (MaxComm). The winner of the Mirabaud Yacht Racing Image 2018 will be announced on October 23, during a public ceremony held at the Yacht Racing Forum. He / she will receive at least € 1’000 prize money. The winners of the YRF delegates and public award will be announced at the same time, and celebrated on the same occasion. They will each receive at least € 500 prize money. Yacht Racing Image participants are encouraged to join the Yacht Racing Forum, and contribute to making this an annual celebration of yacht racing photography. The organiser of the Yacht Racing Forum will extend complimentary delegate passes to the photographers who have submitted photos for the contest.